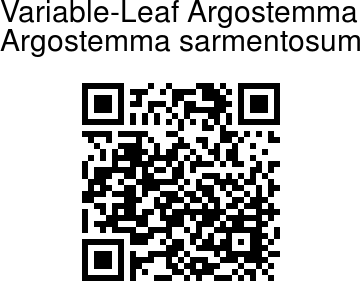 Variable-Leaf Argostemma is a succulent herb, creeping at the base. Stem 7-15 cm long, slender, softly pubescent, sending out long threadlike runners. This species can easily be recognized from the other rubiaceous taxa by its having leaves of two or more shapes and sizes. Leaves are opposite decussate, opposite pair unequal, uppermost smaller, ovate elliptic or rounded, entire, obtuse, smaller 1-2 cm and larger up to 10 cm long, puberulous above, villous on nerves beneath; Leaf-stalk is about 2-3 mm. Inflorescence is a terminal umbel or corymbiform raceme, 6-10-flowered. Peduncle is 3-6 cm long, fleshy, glabrous; bracts ovate, 3.5-4 mm long. 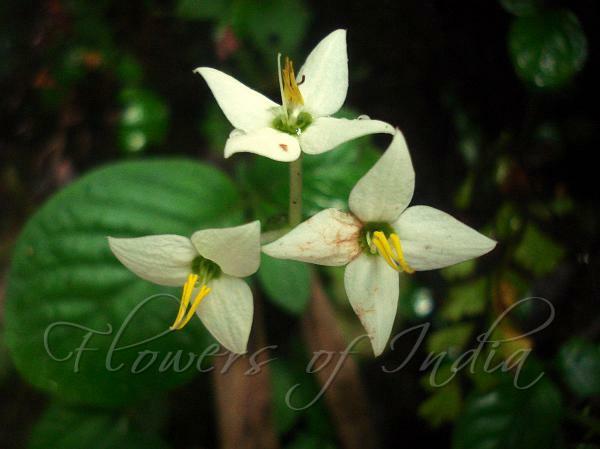 Flowers are white, about 1.5 cm across ,with 4 white petals. Flower-stalks are 8-9 mm long. The green cup holding the flower is 1.5 mm long, concave, sepals 4, about 2 mm, ovate, acute, pubescent. Petals are 4, valvate in bud, 7-8 x 2.5-3 mm, lanceolate, acute, greenish at the base; tube very short, throat naked, filaments short, inserted in the throat, c. 2.5 mm, bent downwards, anthers, c. 6 mm long. Disc somewhat thickened. Ovary 2-locular, many-ovuled; style c. 7.5 mm, filiform; stigma fleshy, concave, capitate. Variable-Leaf Argostemma is found in the Himalayas, from Mussoorie to Bhutan, Assam, Burma, at altutudes of 300-2100 m. Flowering: August.